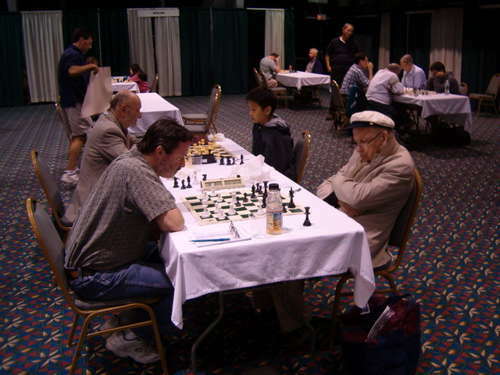 09.08.08 Long-time Maine chessplayer and former University of Maine Professor Fred Irons took a trip to Boxborough, Massachusetts to compete in the 68th New England Open. In this report Fred brings his own unique insight to the challenges of a senior player competing against the game's youth. 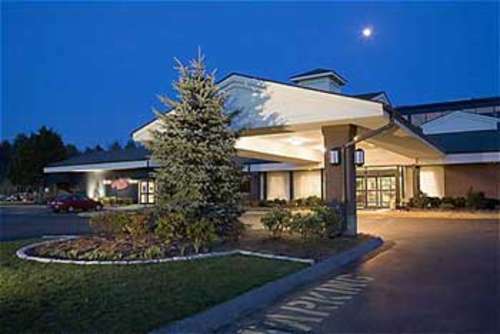 Holiday Inn in Boxboro, MA. while getting a half point for each bye round. The end of a round at the Holiday Inn Conference Center. In addition to the Open, there were five other tournaments held over the weekend. Speed Championship on Sat in 5-rounds at G/5 plus quick rated double Swiss. The following photo shows two Alexes battling it out for first place in the Open final round. Alex Cherniak is on white against a perennial champion, Alex Ivanov on black. when Lee Doucette ran a string of tournaments. Alex Cherniak (left) working hard to think about the position in his game vs Alex Ivanov. that Fischer gave in his early chess days. states. Basically he complimented me for coming down to get beat by the students. I lost to Neil Cousin (1945) but we just about used all of our time for the game. it was aimed right at my King and Rook crammed into the corner. and a pawn, but my analysis was giving mate in at least four no matter what I did. turned my brain to mush. I prepared for this tournament over several weeks so I was psyched to do better this time. I will share my game 2 with you to try and illustrate the problem us declining oldsters have to deal with as we try to keep up our chess game in relation to what we used to be able to do at our peak. I think John Curdo may be experiencing some of these problems as his rating appears to be bottomed at 2200 right now. He knows he used to play at a Master level, (he is a Life Master), and so it has to be frustrating for him to have bad things happen, in spite of his best intentions for it not to happen. John withdrew from the last round of the tournament and I can fully empathize with how he must feel about it. 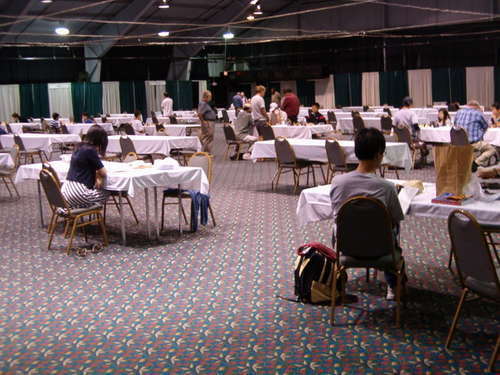 He was at the forefront of NE chess for several decades and the Open championship almost always went through him during that time period. Fred Irons (1500) vs Eric Chen (1225), a fifth grader, Round 2.
as I pointed out how he had erred on the opening by trapping his Knight. to want to retreat their pieces when they are misplaced. And this also shows that when you are not playing well, maybe you should withdraw. It's allowed by the rules. appeared like magic. I felt like I was truly running on air instead of regular. I won the last game against a 1400 student. I think my endurance was better than his. experience in the great game! Enjoyed Fred Irons' writing on the NEO. In the '70s and '80s, I somehow managed at least 2 tourneys a month---so that many of the names had faces to go with them. Most are new--to me. It is quite poignant to me to see the warhorse of NE chess, Curdo, Terrie, Kelleher, et al, still laboring at the game we love. Age steals from us all. Thanks, Fred and Dan, for some revived memories that still have bite and meaning. Good Chess! !